New Delhi, the Taj Mahal is no longer to drive two and a half hours Thursday with the opening of the Yamuna Expressway to Greater Noida to Agra 165 km six-lane freeway linking. Uttar Pradesh Chief Minister Akhilesh Yadav Express, infrastructure major Jaypee Group Luckow a video conference through the state capital, the building was inaugurated. Officials said the Noida Expressway promoter, Jaganpur, Mirzapur 500 each hectare in five will develop integrated townships, Tappal near Aligarh and Agra to Mammon. Permission has been obtained for toll money. 38 km, 95 km and 150 km from Greater Noida to three points per km for cars will be 2.10. Uttar Pradesh Chief Minister Akhilesh Yadav Yamuna Expressway was inaugurated today, but via videoconference from Lucknow. 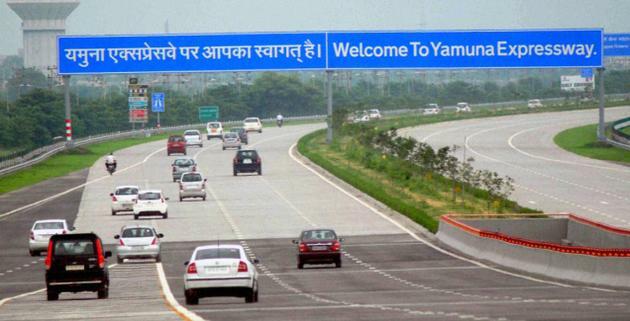 With six lanes, freeway linking Greater Noida to Agra 165 km. Project, Chief Minister Mayawati, who was voted in May this year had begun. Board out of our name ... How can we help? Express, which has three toll plaza opens at 4. Expressway to the land acquisition was made last year when a violent peasant movement kiln - Parsaul broke out in the villages. It is blatantly shameful action of governments in India be it state or center. First they demand tax, most of which is paid by the middle class salaried person, in the name of giving us all the infrastructure and then they give the projects to private companies. Why the hell it is called PPP, when government is not paying anything. and if it is paying then why we have to shell out huge amnts for toll tax. At Ludhiana a bus has to pay Rs 40 every time it leaves the stand, if we take avg 5 buses leaving the stand in one min the amount the company is getting in day is Rs 2.88 lac. that way it will earn more than Rs 10Cr in a year. the fee collection does not come to end in a couple of years but goes on and on. Now this is the way we get Ambanis in our country.